Aristotle and me. We’re tight. My self timing skills were a tad off this week it seems: the official time was 24:16. I tried something a little different for myself today. I have been doing some quick warm up jogs recently; before the last race I did a mile around the Worcester State campus. Today, I went out early and ran the entire 3.1-Mile course counterclockwise. I didn’t burn myself up doing it, but I did have a nice little 8:20 pace going which is actually faster than some of my race times so I wasn’t sure how I would perform today. As it turns out, I gained 8 seconds on my previous personal best in this direction on this course – and 6 second on my previous best on this course in either direction. This one didn’t feel as fast as the previous two races, but it turns out I conserved a little more energy instead of blowing the doors off the first mile. I thought I just felt a little sluggish, but the second and third miles were faster. Over the last few weeks, my resting heart rate has come down quite steadily as well; by mile 1 my heart rate had spiked far above what might be considered 100% at my age, but came down to a more manageable rate when I slowed down just a little bit. While I knew my conditioning was getting better and I knew it should play out in my race time, I didn’t know how it would play out. I’m encouraged. Slower first mile made for a couple of faster miles thereafter. I’m hoping to get a long training run in tomorrow, so no racing, but the weather may have something to say about that (in which case, it’ll be the treadmill). I’m scared and excited about the Stu’s 30k Race next weekend, which will be my longest street race ever. November 25, 2017: 24:55 Sunny and 28 degrees. October 28, 2017: 24:53 Sunny and 56 degrees. I’ve known this guy since 1984. 34 years. Hard to believe that there was a time that neither of us had gray hair. 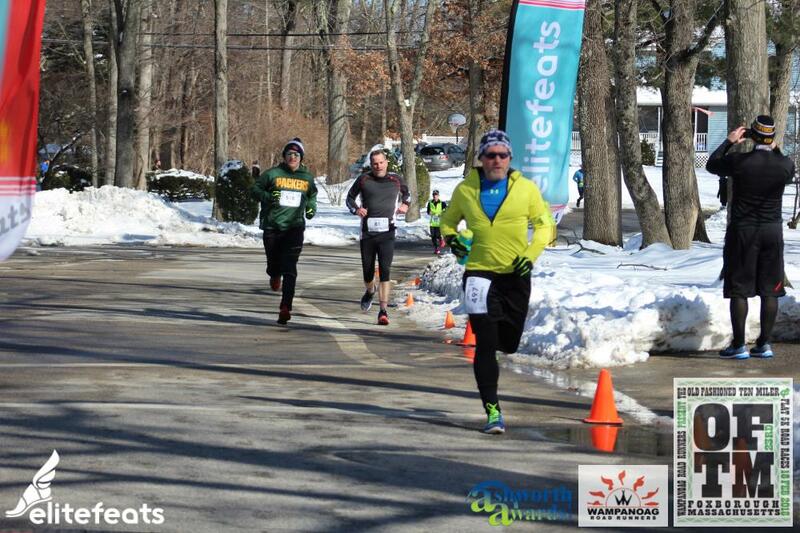 February races in New England are always a crap shoot. Last night, there was a predicted 3-6″ of snowfall expected in Foxborough, Massachusetts but temperatures by race time were expected to be in the 40’s. Crap shoot. Come race time, it was as predicted. Snowfall had been pretty on point, temps had been on point, and therefore the expected snow melt and patchy streets were pretty much on point. To be perfectly honest, I was actually really impressed with the work the Foxborough Highway Department had clearly put in to street clearing. The OFTM is but one race today. I wouldn’t call it a “running festival” (like anyone really likes running or considers it a festival), but it is a combination event: a 5k, a 10-miler and a combination event. So you have a choice between the “Flat 5k,” “The Old Fashioned Ten Miler,” or doing them both for a combination half marathon dubbed the “Badass Combo.” I do wonder how the residents feel about having “Badass Combo” signs plastered about, but that’s not my circus (or festival as the case may be). It’s good to have friends . I did the “Badass Combo” last year: Crushed the 5k for what was then a personal record, but bonked hard on the ten miler. I hadn’t eaten properly so my nutrition was off, I was cramping up and it felt like I walked far more than I actually ran. I don’t know if it was the 20-25 minutes or so between races or, more than likely, a combination of a bunch of deleterious circumstances. The end result was a 1:36:00 (or so) finish for the OFTM and just over 2:00:00 for the combo. I was trying to decide what to do this year, but in the end decided that I wasn’t going to spend $40 on a 5k entry just to get a swanky medal, so I went strictly with the 10-Miler. I ran at a pretty quick pace for the first 2 miles or so, settled into my pace for the next five miles or so, but at mile 8 I just hit a mental block and decided I had to walk for a bit. No real explanation: I was running at about an 8:48 pace for the previous 2-miles, the first of which was generally flat, the second was a gain of all of 26′, mile 8 had a gain of 26′ as well, but I just couldn’t carry myself over that hump. By mile 9 I had pulled myself together back to an 8:40 (downhill again!) and mile 10 was my fastest of the day at 8:05. It was a struggle at the end though, because I knew I was burning fuel pretty good, but I really wanted to smash the finish. There were a few finish line shots I could have used here that were technically better pictures, but this one doesn’t show my pudgy belly quite as ostentatiously as the others. Also, it does a nice job of demonstrating I didn’t finish last. At days end, it wound up being my third fastest 10-mile effort (according to Strava), so not a complete bomb. Not as fast as I had hoped to be, but even my half-assed effort at mile 8 didn’t keep me from hitting that. I really needed to be at about 8:20 pace and that wasn’t happening today. I feel good about it though, I haven’t been running nearly as many long runs as I know I should, so this was a personal victory. My muscles felt good, and I still had some juice after 9 miles to hit that 8:05 pace – no small victory for me. In the greater scheme of things, I finished pretty much in the middle of the pack. I’ll take it. Weather: Averaged about 40-degrees, clear, breezy, but sunny. Some melting snow. This is the first time this year I’ve raced the course counter-clockwise. I’m usually much faster going clockwise: the first mile or so is downhill, and then the elevation gain is slow and gradual. Not to put too fine a point on it, it’s a relatively flat course anyway, but there is some elevation change. Running clockwise gives me that pronounced elevation loss to get my pace up and just burn through the first half of it. Running counter-clockwise has always posed me some issues. It starts out pretty flat, the elevation loss is gradual (the reciprocal of the clockwise course, obvi) and then a half mile of the last .8 of the course it just up. Again, not “UP”…but up. Suffice to say, the better runners in the group seem to like the counter-clockwise better; the less well heeled runners, the clockwise direction. As you’ll see below, my track record going in this direction is spotty and erratic. At least one of the times – February 11, 2017 – was affected by a snowpacked course: I wore obstacle course specific shoes to maintain some traction on the street, but even without that outlier my paces are uneven. It was pretty chilly to start – about 28 degrees: when you’re standing around a sweatshirt leaves you still a little cold, but warm enough that choosing gear is a bit of a challenge. Should I take off the Under Armour? Will a cold weather shirt suffice? Gloves? No gloves today, sweatshirt and cold weather shirt. Athletic pants. All of which seemed to be the right choice for me as I was neither overheated or cold. One caveat: while running the Upton State Forest Half Marathon last year, I wiped out and skinned my knee and (I think) broke my left pointer finger. It hasn’t felt right since, and it has been the first finger to get noticeably cold since. On the “go” command, I was off at a decent clip. I had my watch under my sleeve as I was using the sleeve to cover my hands in lieu of gloves so I really couldn’t see the pace or time. I was just running. I kept up with the fast kids for a short moment, but they were gone pretty quickly. At the first mile the watch vibrated, so I pulled up my sleeve to see and it was about a 7:20 pace. That astonished me. The second mile was about a 7:40 pace, quite astonishing to me. Ah, but June Street. That point when running clockwise is a nice shot down, is much less friendly to me when it’s a harrowing shot up. I just couldn’t maintain my pace, and slowed way down. I finished that mile with an 8:20 or so pace, so not horrible in terms of my usual pace, but certainly enough to kill my shot at a sub-24 minute race. The upshot is that I ran a pretty strong race overall, faltered a bit toward the end, but still wound up with a personal record for the Counter-Clockwise direction and truly for the course in either direction overall. It was a good race day. Overall, I finished in the middle of the pack, 10th of about 21 or 22. 9th was within my grasp, but I was outflanked by a far better runner – finishing as close behind him is a personal victory to begin with, never mind having had the chance to finish ahead of him. So, I’ll add that to my awards case too. Learn to play in the tall grass. The evening of February 3, 2002 was a magical time, truly one of disbelief. That was the evening the New England Patriots became Super Bowl Champions for the first time, led by 24-year old Tom Brady. This is a guy who truly lived the embodiment of what I preach to myself all the time: do the things you need to do to put yourself in position when that big break happens. He was the 199th draft pick in the 2000 draft: he was never the #1 guy, but he worked incredibly hard and kept working hard. He even had a back up plan in case football didn’t work out for him. He was a 4th string QB for the Patriots that 2000 season. Think about it: the team which almost never carries three QBs carried four. They liked him. They liked his drive, his intelligence, but also knew he wasn’t quite ready to carry the load. He earned his shot and he kept earning it. By that fateful game in 2001 that ended Drew Bledsoe’s run as starter in New England, Brady had worked his way up to second on the depth chart. Work ethic, and determination at play. All the reps with the practice squad, all the time studying film. Everything he did positioned him to be there when fate called. My wife and I went to game 10 on the season, the St. Louis Rams at the New England Patriots, and I remember saying to her that this would be the Pats’ Super Bowl – the Rams looked unbeatable, world class. Indeed, the Pats lost that game by a touchdown, but on the way home we agreed that they looked really good and had a decent chance to win. They wouldn’t lose again that season. Why, some 16-years later, on the eve of Tom’s 8th Super Bowl appearance, am I writing about THIS game? It serves to highlight what I hope to be. I hope to best position myself to take advantage of that big break should it come. I hope to be positioned through doing the work I need to do to be ready. One doesn’t just wake up and run a marathon, or even ten miles as I learned this morning after having taken too much time between long runs. It’s a reminder to keep doing what I need to be doing, to set my goals, do the work toward those goals, and if I’m comfortable that I’ve done the work, the results will speak for themselves: I’ll either be up to the challenge or I won’t, but there will be no excuses for failure. The one vignette that sticks out to me as highlighting emotional intelligence, the complete confidence that comes with being prepared, and the recognition that all the prep work has been done and no more worry or work can improve the outcome – indeed may serve as detriment to accomplishing goals – is this one: before biggest game of his life, Super Bowl XXXVI, this 24 year old (let that sink in for a moment) took a nap in the locker room. Not because he was overtired, but because he was relaxed. I ran a half marathon in October. I went to bed early, but within a few hours I found I couldn’t sleep. I was so amped up. Eventually I found I was tired but afraid to go back to sleep for fear of oversleeping. So I drove to the city, parked and tried to sleep in the front seat of my car. Like that was a thing that was going to happen. I didn’t eat well, I didn’t sleep well. I was a hot mess and the results show it. This for a half marathon that I didn’t even pay an entry fee for. 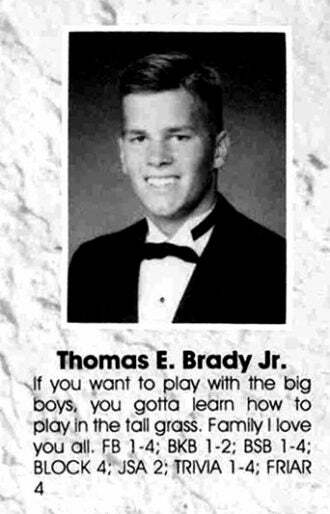 Brady, on the night he would define his career with millions of people world wide watching, with millions of dollars in future earnings on the line and a legacy to be had, he fell asleep because he was just THAT prepared. There is some debate as to whether it was 20-30 minutes or if it was a couple hours, but it doesn’t matter. He was so relaxed in his preparation, on the biggest stage he could nap. I had a 45-minute presentation I had to give to leaders in my organization this week. I was nervous, I was prepared but nervous. There was no way I was going to take a nap, though. I have to imagine in those moments leading up to the start of Super Bowl XXXVI, TB12 just felt confidence, conscious competence. When you do the pre-work, you’ve spent the time studying, you’ve worked as hard as you can work, you know nothing else you can do will make your performance better. Could I have made my performance better? Absolutely. I can think of a hundred things I could have done beforehand that would have yielded incrementally better results. I didn’t take the time to do them, and as a result I was amped up and nervous. “By the time you spike that ball, you’ve got 40 seconds and you’re thinking ‘this is for the World Championship.’” That’s what it’s all about, isn’t it. Its about doing your job day in and day out at a high level without thinking about what could happen at some other point. It’s about making incrementally better decisions, better outcomes, and with those outcomes putting yourself in position to achieve your ultimate goal. Seven seconds left on the clock as he spiked the ball on the 30 yard line to set up the Vinatieri field goal was the point at which he said, “this is for the World Championship.” Not with a minute-thirty left. Not in the locker room. After his work was complete. With the spike, and a confident out reach of his hand, the ball lands softly and his work is done. Every day isn’t the World Championship, not every job has a world championship hinging on the outcome of the smaller tasks during the year, but excellence, preparedness, execution those are the hallmarks of putting yourself in position to best achieve when called on. I’m trying to remember that. Study, prepare, anticipate, prepare, know the goal, prepare, work, prepare… EXECUTE. That’s why it’s important to not only find something you like to do, but to find something you’re passionate about doing. Put the time in, work it. Done consistently, you will be in position to do the most with that next opportunity, whenever, and wherever it comes. Author MoPosted on February 4, 2018 Categories Inspiration, People & Places, SportsTags execution, preparation, Super Bowl, Tom BradyLeave a comment on Learn to play in the tall grass.